‘Tech 4 Good Day’ (previously known as NGO Connection Day) over the past 7 years, has been a training, networking and information-sharing event for non-profit organizations. Microsoft has partnered with Paradigm Initiative Nigeria to help NGOs adopt Microsoft technology, use social media effectively, understand digital security, use research and report publishing tools, as well as web/blog development. In the recent years, the focus has been getting the NGOs acquainted with Office 365 as a huge productivity platform in the cloud. This year, ‘Tech 4 Good Day’ will strengthen this focus by dedicating more sessions to helping the participating organizations understand Office 365 in details, as well as walking them through the different scenarios/testimonials of the platform. This will be done in addition to the trainings on social media, research, and digital security. Tech 4 Good Day is slated for 11 May 2016 and would hold in Lagos Nigeria. Organizers are not able to provide accommodation or travel support to those who may be coming from outside Lagos, only meals and conference materials are provided. The registration link bit.ly/tech4good2016 is open until Wednesday 6 April 2016. Paradigm Initiative Nigeria (PIN) is a social enterprise that connects underserved youth with ICT-enabled opportunities, with specific concern about the ill effects of unemployment and poverty, among other vices that limit the potential contribution of young Nigerians to the nation’s economy. We have worked with government, civil society, private institutions and international organizations including the United Nations to set standards in ICT education, tele-center support, ICT applications in rural areas, and other ICT interventions in Nigeria. LAGOS, Thursday, March 24, 2016: A Federal High Court in Lagos has directed that the National Assembly be “put on notice” before the court would consider an application seeking to restrain both the Senate and House of Representatives from passing the Frivolous Petitions (Prohibition, Etc) Bill, otherwise known as the Anti-Social Media Bill. A Federal High Court in Lagos has directed that the National Assembly be “put on notice” before the court would consider an application seeking to restrain both the Senate and House of Representatives from passing the Frivolous Petitions (Prohibition, Etc) Bill, otherwise known as the Anti-Social Media Bill. Justice Mojisola Olatoregun-Ishola gave the directive while declining to grant a motion exparte brought by three non-governmental organizations (NGOs), Enough is Enough Nigeria (EIE); Media Rights Agenda (MRA) and Paradigm Initiative Nigeria (PIN), in a suit challenging the constitutionality of the proposed Law. Mr. Olumide Babalola, lawyer to the NGOs, had brought the motion on March 23, asking the court to issue an interim injunction to restrain the National Assembly from taking further steps at deliberating on and/or reading the Frivolous Petitions (Prohibition etc.) Bill 2015 for the purpose of passing it into law pending the hearing and determination of the substantive suit pending before the court. The organizations also sought an interim order of the court directing the parties in the suit to maintain the status quo pending the hearing and determination of the suit and to refrain from all acts that would undermine the adjudicatory powers of the court over the subject matter of the suit pending the hearing and resolution of the suit. Observing that the suit is a very crucial one, Justice Olatoregun-Ishola said the Senate and House of Representatives ought to be in the know. She, however, advised Mr. Babalola not to hesitate to approach the Court if there is any adverse act by the National Assembly on the matter during the Easter vacation. 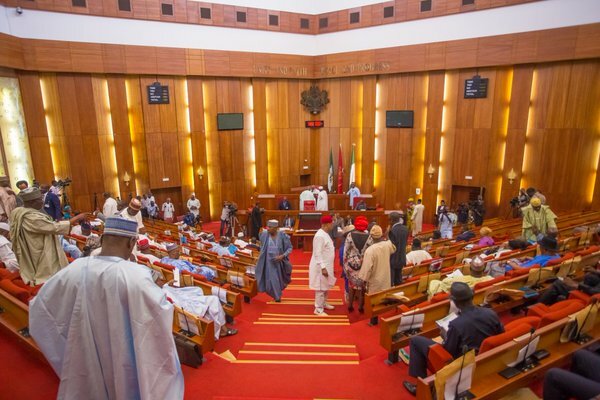 The respondents in the suit filed on March 21 by Mr. Babalola on behalf of the NGO are the President of the Senate, the Speaker of the House of Representatives, the National Assembly, Senator Abdulfatai Buhari, Chairman of the Senate Committee on Information, Communications Technology and Cybercrime; Senator David Umaru, Chairman of the Senate Committee on the Judiciary; Senator Samuel Anyanwu,Chairman of the Senate Committee on Ethics and Privileges; Senator Bala Na’Allah, the Deputy Majority Leader of the Senate and sponsor of the Bill; and the Attorney-General of the Federation. A perpetual injunction restraining the first seven Respondents , their agents, officers and/or representatives from further deliberating, meeting and/or reading the Bill with the aim of passing it into Law. The NGOs are contending that the provisions of the Bill are not justifiable in a democratic setting and would further deepen corruption in Nigeria as it seeks to gag the press and whistleblowers who report untoward practices within private and public circles. They are also claiming that the Bill would hamper the investigation and prosecution of crimes in Nigeria as informants and witnesses would now be disqualified for failure to first depose to affidavits, adding that their rights as journalists and organizations promoting freedom of expression, freedom of the press and good governance would also be violated. Justice Olatoregun-Ishola has adjourned further proceedings to April 13, 2016. The two-day event took place on the 8th and 9th March 2016, and had delegates from Cameroun, Cote D’Ivoire, Gambia, Ghana, Kenya, Nigeria, Senegal, South Africa and Uganda in attendance. 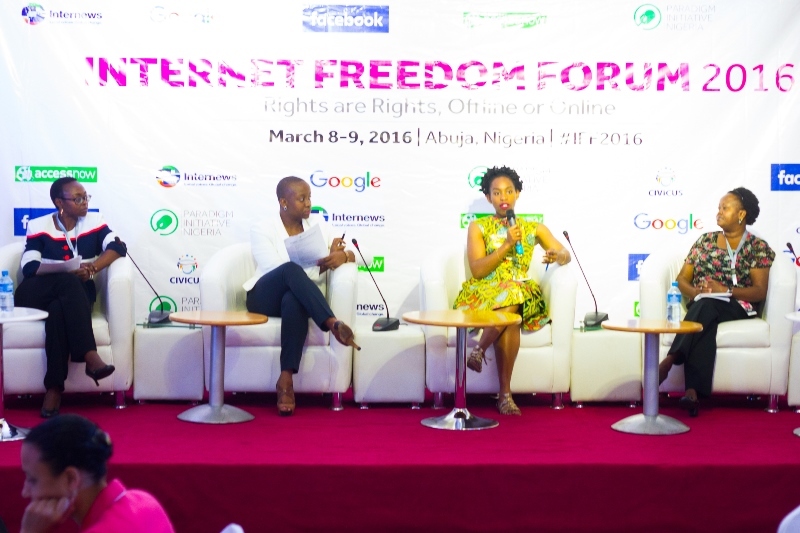 The Internet Freedom Forum is a yearly event focused on indices around Internet Freedom in Nigeria. This year’s forum deepened discussions on how freedom and openness on the Internet promotes. The keynote for the event was delivered by Nani Jansen, the Legal economic and social development in Nigeria and around Africa, discussions usually involve policymakers, lawmakers, academic institutions and civil society organizations, amongst other stakeholders. Director at Media Legal Defense Initiative. Drawing on the global context of online right issues, Nani spoke about liability of third party content, the role intermediaries play in monitoring content published online and the challenges they face for not taking down content which is not necessarily illegal, but is offensive to certain parties. Following her presentation were 7 highly engaging panels over the duration of the forum. Topics ranged from ‘Internet Freedom views across the African Continent’ to ‘Women’s rights Online,’ in celebration of International Women’s Day. There were also panels on the ‘Digital Rights and Freedom Bill,’ ‘Internet Surveillance and Government Transparency,’ ‘Internet Freedom as key to Active Citizenship,’ and ‘Data Privacy and Lack of Regulatory Framework.’ The African Declaration on Internet Rights and Freedom was also launched during the two-day event. The discussions drew participation from both the executive and legislative arms of government with the Ministry of Communications on the panel discussing ‘Internet Surveillance and Government Transparency,’ and the Ministry of Justice on the panel discussing ‘Data Privacy and Lack of Regulatory Frameworks.’ The Senate President, Dr. Bukola Saraki was represented by his Special Adviser on Information Communication Technology, Mr. Yakubu Ibrahim at the launch of the ‘African Declaration on Internet Rights and Freedom.’ The Vice-Chairman, House Committee on Telecommunications, Hon Emeka Ujam, sat on the panel that reviewed the Digital Rights and Freedom Bill and promised to ensure the bill is read twice on the floor of House of Representatives in the year 2016. In the same vein, his counterpart from the Senate, Senator ‘Jide Omoworare; Chairman, Senate Committee on Rules and Business, promised to support the bill to see the light of the day at the Senate. The Office of the National Security Adviser equally made an appearance at the forum. ‘Gbenga Sesan, The Executive Director of Paradigm Initiative Nigeria while speaking on the Internet Surveillance and Government Transparency panel posited that “It is important to have the conversation on the safeguard of citizens’ right in the online space so that people are not wrongly accused and so that when people who work in the security agencies become ordinary citizens, they will also be protected by the frameworks put in place” Also, the newly appointed Special Assistant to President Buhari on New Media, Tolu Ogunlesi who moderated the final session at the Internet Freedom Forum remarked that “While Internet freedom is the key to active citizenship, active citizenship is also the key to Internet freedom”. In his closing, Program Manager ICT Policy at Paradigm Initiative Nigeria ‘Boye Adegoke hinted that the forum will have a broader representation in year 2017, and urged delegates to keep doing the great work in the defense of a free and open Internet. The event held with support from Google, AccessNow, Facebook, Civicus, Internews, and Alliance for Affordable Internet. 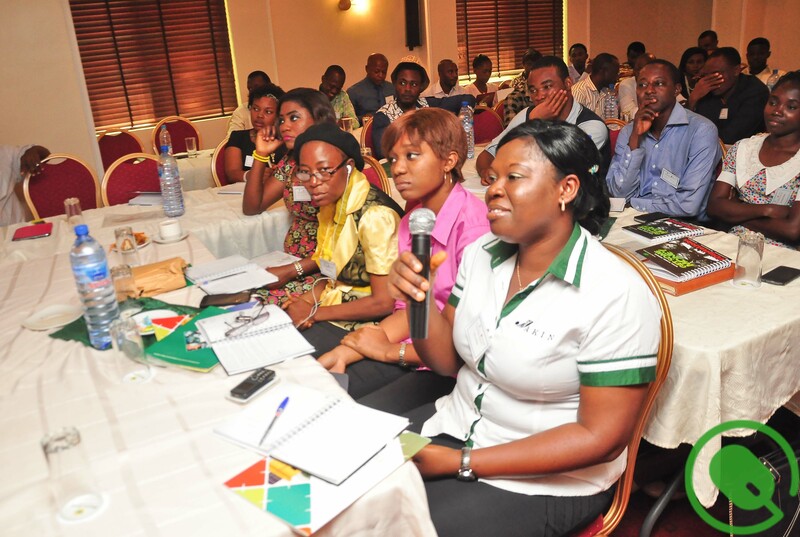 Media Partners include TechCabal and Civil Society News. SMILE Nigeria was present as Broadband Partner. To fight back, the global community that cares about free expression needs to unite behind common principles, and spread the word: when users’ rights are under attack, we have your back. As members of the Nigerian Senate hold the public hearing, they should not be left in doubt regarding the dangers of the Social Media Bill or any other bill that clamps down on expression online. It should be withdrawn immediately. Nigerians have spoken out, and their leaders should listen.